Sivantos has announced the release of its Signia Nx hearing aid instrument family, which incorporates the company’s new Own Voice Processing (OVPTM) system. According to the company, the new Signia Nx technology uses a high speed classifier system that “ensures soundscape and own voice processing work in parallel to replicate natural sound perception”. Powered by Signia’s Ultra HD e2e binaural system, the Nx’s microphone system identifies the sound path of the wearer’s voice as it travels to the hearing aids. The aids can identify the wearer’s own voice apart from all other voices via unique characteristics, to then process it independently from all other sounds. According to the company, this allows hearing professionals to fine-tune the hearing aids without having to compromise audibility in order to improve the sound quality of the wearer’s own voice. Using the newly developed algorithms in the Nx platform, the hearing aid’s classification system also scans and locates sound in the listening environment to help improve spatial awareness and localization. According to Sivantos, the Nx’s new chip delivers processing power equivalent to 500 MIPS (million instructions per second). The company says this fast chip speed is key to its classification system’s ability to quickly and automatically drive needed hearing aid features in a variety of listening situations. The Signia Nx family includes 3 Made-for-iPhone options : Pure 312 Nx, Pure 13 Nx and Motion 13 Nx. The Pure 312 Nx receiver-in-canal (RIC) device offers wearers the smallest size, along with full connectivity. With its higher-capacity size 13 battery, the slim RIC Pure 13 Nx delivers the longest streaming time. The Motion 13 Nx Behind-The-Ear (BTE) aid provides full connectivity in a smaller housing, which includes an optional modular T-coil integrated into the battery door. All three Nx hearing aid models can use the myControl™ app 2.0. In addition to other features, the app offers remote control capability, along with 360º microphone steering. Users of the app can adjust program and volume, sound, power on delay, low battery interval, and airplane mode. The company said the new Signia Nx family of instruments, in 7nx, 5 nx, and 3 nx technology levels, will be available starting in November 2017. 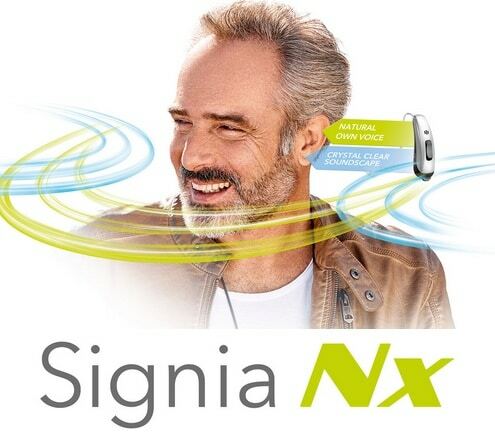 Hi, This is thoroughly informative about Signia Pure Nx Hearing Aids. The OVP feature is great addition, as well as the iPhone App that pairs with them. Great work!